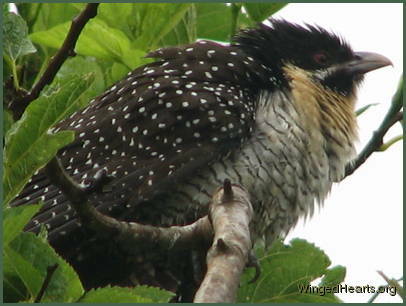 Popularly called storm birds, many species of cuckoos live around the region. The birds themselves tend to be shy and elusive as they are not too popular amongst the birds due to their infamous breeding habits. 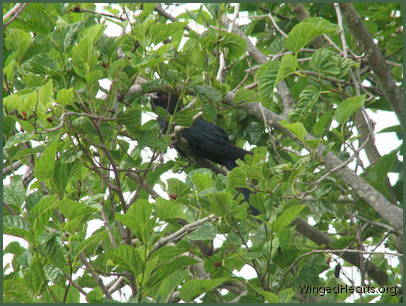 The crows have fallen victim more than once and yet lovingly raised several channel-billed cuckoos. 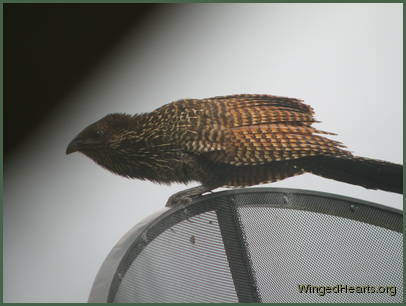 The experience has made them quite wary and they do tend to chase the cuckoos when they can. But the cuckoo is a persistent bird and quite devious in its ways. 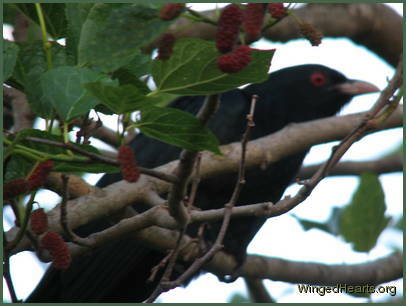 I've seen the male keep guard while the female checks out the nests of other birds. I would have shooed them away except I knew the nest was empty. 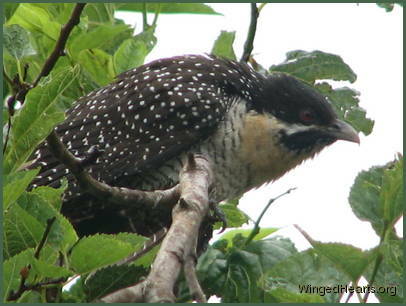 The cuckoo birds around our yard are intrigued by the friendship other birds have with us and have been forthcoming in making friends with us too. 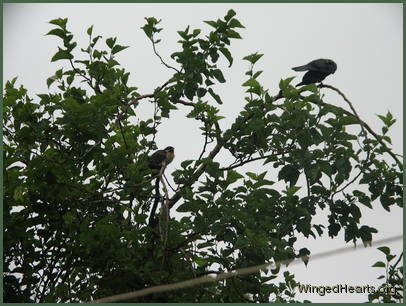 The female koel (left) was hiding in the mulberry bush, hoping the crows would lose interest. But when I spoke to her and asked her to come out for a shot, she shyly obliged. Not only did she come out and pose for the camera, but stayed for a quite a while overcoming her nervousness and anxiety of humans and crows. 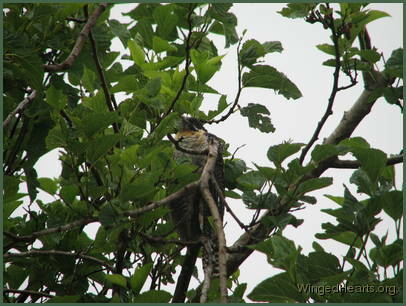 Her male friend (below) would hide in the tree and make his mating calls incessantly for weeks. He needed more encouragement, but eventually did let me take some shots before finding a partner. 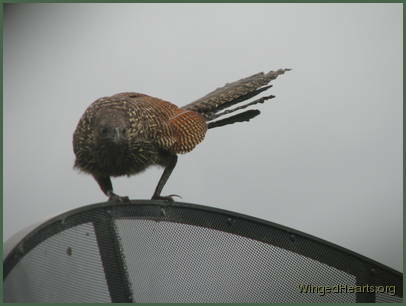 The Pheasant Coucal too couldn't resist posing for the camera for a few brief seconds. 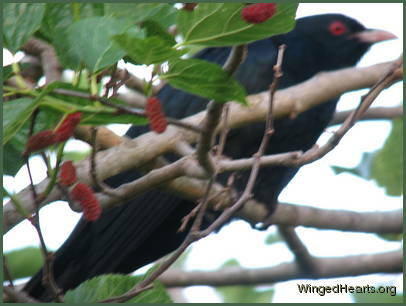 Previous Slide 1/8 NextKoel - maleHiding in the bushes - a good disguise Koel - maleDon't my eyes look like berries and my beak like a twig? Koel - maleBut I will stay still for a shot or two because you asked me Koel - femaleA good place for the shy and elusive females Koel - femaleAs long as the crow stays away Koel - femaleBut I will emerge for the lady with the camera who is asking me nicely Pheasant CoucalLet me stop by and say hello Pheasant CoucalI hope my feathers look glossy through the window!